Photo: Andy Kocher and Kahlua. Lexington, Ky. – May 17, 2018 – Thursday evening at the Kentucky Horse Park once again welcomed the $35,000 Hagyard Lexington Classic CSI3*, the second event in the seven-part series, sponsored by Hagyard Equine Medical Institute. The audience of the Rolex Stadium watched 61 starters over Guilherme Jorge’s (BRA) 16-effort course as an impressive 16 horse-and-rider combinations delivered clear rounds, but once again Andy Kocher (USA) and Kahlua could not be caught, and the pair captured their second consecutive win of the Kentucky Spring Classic. Lexington, Ky. – May 16, 2018 – The second week of CSI3* competition at the Kentucky Horse Park kicked off during the Kentucky Spring Classic with the $35,000 1.45m Welcome Speed in the Rolex Stadium where 36 horse-and-rider combinations raced ahead of the rain, contesting Guilherme Jorge’s (BRA) 14-effort track. The speed class saw eleven clear rounds, but Andy Kocher (USA) was uncatchable as he raced to the victory aboard Christian Rogge of Top Line Sporthorse International, LLC’s Kahlua with over two seconds separating him at the top. Earlier in the day, in the Stonelea Ring at the Kentucky Horse Park, hunter competition began with 10 competitors vying for the Green Hunter Incentive Stake’s top prize. Horse-and-rider combinations competed in the 3’6” and 3’9” sections of the Green Hunters, with one round being designated toward the stake’s final results. It was Chris Payne and Ovo who claimed Wednesday’s top ride after putting in a near flawless round that would earn them a winning score of 88. Ovo, an 8-year-old Swedish Warmblood gelding, was purchased by Melissa Jacobs in November of 2017 from The Hunt, a European hunter auction organized by Chris Sorenson. Payne took over the reins during the start of the Winter Equestrian Festival (WEF) in Wellington, Florida. Payne and Ovo have had a successful partnership, finding themselves in top placings consistently throughout the WEF circuit. Second place was captured by Havens Schatt and Diantendro with a score of 85. Tim Goguen and Just A Cobbler secured third place with a score of 83. It was a day of many “firsts” for Andy Kocher. Last to go in an eight-horse jump-off, Kocher (USA) and Navalo de Poheton claimed their first World Cup qualifier victory in the $100,000 Longines FEI World Cup™ Jumping Del Mar. As a result, Kocher has now pushed into lead position of the standings in the east coast sub league of the North American League. (C) ESI PHOTOGRAPHY. Andy Kocher and Ciana. After two Grand Prix wins and several top ribbon placings in the Ocala Horse Properties Stadium during the Ocala Winter Circuit, Andy Kocher of Lake St. Louis, Missouri returned to the iconic stadium to once again snag a win, this time in the $50,000 KindredBio Grand Prix. Next in was Andrea Torres Guerreiro, a fiery, Columbian-equestrian with several top finishes in HITS Ocala’s featured Grand Prix. Torres Guerreiro proved herself a force to be reckoned with, powering through the course aboard her horse, Fifty Shades. They passed the timers in 37.44, a few seconds shy of the lead, but a round that would hold up for the rest of the class to ultimately give them fifth place. Another clear round would not be seen until the second-to-last horse in the order, Conthendrix, owned and ridden by Andre Thieme of Germany. Thieme and his mount laid down a valiant effort to catch Kocher’s leading time, leaving all of the rails up. Their time of 36.54 moved them ahead of Ryan and Torres Guerreiro and into the third-place slot. (C) ESI Photography. Andrew Kocher and USA Today. Ocala, FL (December 19, 2016): As the curtain closed on the two-week HITS Holiday Series at HITS Post Time Farm, riders gathered to compete in the finale of the series, the $25,000 HITS Grand Prix. The rider to beat would be Andy Kocher of Lake St. Louis, Missouri riding USA Today, owned by MKO Equestrian. Kocher won the $10,000 Open Prix the day prior to Sunday’s class, as well as the $25,000 SmartPak Grand Prix in the first week of the series, along with several other top five prizes. Eight horses and riders would advance over the first round course, designed by Ken Krome of Westminster, Maryland, to vie for the win in the jump-off – where half of the lot would gain clear rounds again. The first to compete over the shortened course was Christina Kelly of Aiken, South Carolina and The Kingdom, owned by Andrea O’Brien. They flew through the course, laying down a solid, clear round in 37.266 to set the tone for the remaining field. When the class was finished, they would take home the second-place prize. Next to garner a clear round as the third trip in the jump-off were the victors, Kocher and USA Today. They shaved a full two seconds off of Kelly’s time to move up the leaderboard with a time of 35.070, where the lead would remain. Ontario equestrian Kim Farlinger entered fifth in the jump-off order to give the crowd another clean round. She piloted Charming Force B, owned by Kim Farlinger Stables Ltd., through the timers in 38.563, a round that would settle them into third place. Matthias Hollberg, riding out of Middleburg, Virginia, was the final rider in the jump-off and the last to snag a clear round. Hollberg rode Aletta, owned by Hollberg Equestrian, to the finish clocking in at 39.363, just a second shy of Farlinger for fourth place. The final five rounded out with Margie Engle and Indigo, owned by Gladewinds Farm, Inc. Coming off a victory in Friday’s $25,000 SmartPak Grand Prix, the two were prepped for success, but a heart-breaking rail at the final fence of the jump-off settled them in fifth in 35.797. Andy Kocher and Coconut, owned by Eagle Valley Partners, LLC, have been inching their way up the placings over the two-week Holiday Series, and on Saturday, they pulled off the win. Kocher would also grab two more places in the ribbons, fifth and ninth. In a four horse jump-off where all of the trips were clear, Kocher and Coconut sealed the victory as the quickest and most agile team by three full seconds. First to contend the shortened course was hometown equestrian, Aaron Vale and Stakko, owned by Thinkslikeahorse. They put down a clean trip in 40.260 to set the tone for their peers, ultimately giving them the third-place prize. Jennifer Jones of Marion, South Carolina followed Vale with Benedetto, owned by Andy Kocher. They shaved two seconds off Vale’s time, stopping the clock with all of the rails up in 38.083, eventually earning them second place. The rounds kept getting quicker as Kocher entered the ring with Coconut. They zoomed through the course to finish in a lightning-fast 35.254. The final contenders in the jump-off were Florida equestrian Hayley Waters and Uppie de Lis, owned by Chuck Waters. They mastered the course with all of the rails up, but were not quite fast enough to conquer the trips before them, clocking in at 42.856 for fourth. Fifth place belonged to Kocher and Carlos, owned by Andrew Kocher & MCM Farm. They were foiled by one mere time fault in the first round. Kocher also finished in ninth place with E Pleasure, owned by Angelo Danza. Mill Spring, NC – October 15, 2016 – Andy Kocher (USA) piloted Zantos II to the pair’s second victory this week, taking top honors in the competitive $130,000 Suncast® Grand Prix CSI 3* at Tryon International Equestrian Center (TIEC). Kocher and Zantos II dashed through the jump-off timers, finishing nearly two seconds faster than the rest of the field, stopping the clock in 35.836 seconds. Shane Sweetnam (IRL) and Main Road finished in second place, crossing through the finish in 37.982 seconds, while Adrienne Sternlicht (USA) piloted Toulago to third place with a time of 38.238 seconds. Kocher and Zantos II, owned by MKO Equestrian LLC, finished a strong effort in the first round, contesting a technical track set by Michel Vaillancourt (CAN), which featured 51 entries. After making a quick move in the jump-off, the duo secured the win to best the eight-horse jump-off. Zantos II has proven he’s a top contender for Kocher, who initially believed the gelding would be a good sales prospect when he arrived from England earlier this summer. After collecting a win in the $35,000 1.50m Suncast® Welcome FEI CSI 3* on Thursday, October 13, he felt confident that the pair could secure a fast finish in tonight’s class, but did not expect to earn another win. As Kocher has learned and adjusted to the ride, he believes the pair has found common ground when competing in the ring through the help of a few bit adjustments. He laughed, “I was informed today by my owners after this class that he is no longer going to be a sales project. He’s just a little bullet and we’ve found a bridle that’s a happy medium for him. The two horses Kocher had entered this week in international competition are both new additions to his string and program, as he is saving his ace ride, Uppie De Lis, for larger classes later this season. Kocher noted that the horses have helped to fine tune his own skills, as he cannot make as many mistakes as a rider to ensure they produce clear rounds. Looking ahead, Kocher has plans to now contest the indoor circuit in order to gain valuable qualifying points ahead of FEI World Cup Finals, before setting his sights on a strong winter campaign at the Winter Equestrian Festival (WEF) in Wellington, FL. Kocher’s groom, Cesar Uribe, was awarded with the Groom’s Initiative Award presented by Tryon Equestrian Partners (TEP), in an effort to recognize the dedication and passion of the individuals who play an integral role in the success of top horse and rider combinations. Kocher graciously spoke of Uribe, who joined his team just over a year ago. The Leading Lady Rider Award presented by realtor Meg Atkinson, was awarded to Laura Kraut (USA) for her consistent top finishes throughout the week in FEI competition. Kraut piloted two mounts to the jump-off in the $130,000 Suncast® Grand Prix FEI CSI 3*, finishing in seventh with Confu and eighth aboard Nouvelle. Kraut also earned a third place finish in the $35,000 1.50m Suncast® Welcome CSI 3* aboard Confu. Andy Kocher and Ora Del Te Di La San Giorgio. The Week VI $10,000 Horseflight Open Welcome took place Friday and set the stage for big time show jumping action as the Gulf Coast Winter Classic headed into its final weekend for 2016 in Gulfport. Twenty horse and rider teams tackled the course set on the world class grass grand prix field, considered the best in the United States by Olympic course designers. The first round was set at 78 seconds and the second round at 47 seconds which saw only nine rides go double clean. Andy Kocher of Ocala, Florida and his own Leconte were the first to go in the class and turned in a clean first round in a time of 66.569 seconds. Their second clear round in a time of 38.991 seconds set the new time to beat. Lauren Hester of Lexington, Kentucky and Hester Equestrian, LLC’s Wender followed Kocher with a clear first round in a time of 66.020 seconds. Challenging Kocher’s time, their second round was also clean and their time of 35.617 seconds set the new time to beat and pushed Kocher and Leconte into second position. Kocher returned to the grand prix field, this time in the irons of Eagle Valley Partners’ C’Havinia, and posted a clear first round in a time of 69.364 seconds. Their clear second round in a time of 35.993 would have seen them finish in third place overall. Christopher Schroeder of Wellington, Florida and Scott Head’s Carjo Z followed with double clear rounds in times of 69.503 seconds and 40.737 seconds which would not beat Hester’s time, and the pair would find themselves finishing in ninth place overall. Kocher and Eagle Valley Partners’ Coconut followed Schroeder with double clear rounds in times of 69.55 and 36.677 seconds, respectively. They would finish in fourth place overall. Hester returned to the arena with her second ride of three in the irons of Hester Equestrian, LLC’s Lorstakov. The pair posted double clear rounds in times of 68.668 seconds and 37.705 seconds, which would see them finish in sixth place overall. Penny Brennan of Buhl, Alabama, winner of last week’s $10,000 Horseflight Open Welcome, was up next in the irons of Meco Equestrian, LLC’s Cord 11. Although the pair turned in a clear first round in a time of 70.551, four jump faults at the first fence in their second round in a time of 43.852 seconds would see them finish in eleventh place overall. Schroeder returned to the grand prix field, this time in the irons of GA Performance Horses, LLC’s Diamant De Revel for the next clear first round in a time of 69.574 seconds. Their second round in a time of 38.116 seconds would see them finish in seventh place overall. Kocher and his own Red Lady followed Schroeder with a clear first round in a time of 67.031 seconds. However, four jump faults and a time of 35.226 seconds in their second round would see them finish in tenth place overall. Hester and Hester Equestrian LLC’s Clueless P followed Kocher and turned in a clear first round in a time of 67.639 seconds. Their clear second round in a time of 36.972 seconds would see them finish with a fifth place overall. Kocher and his own Ora Del Te Di La San Giorgio were the last to go in the class and turned in a clear first round in a time of 72.644 seconds. They needed to beat Hester and Wender’s second round time of 35.617 seconds for the win, and by fractions of a second, they did! The pair posted a clear second round in a time of 35.483 seconds, taking the win and giving the second place to Hester and Wender. Mid-seventies, sunny skies and bleachers packed with an audience was the backdrop to today’s $35,000 Apollo Jets Grand Prix that welcomed twenty-five horse and rider teams to the world renowned grass grand prix field on a course designed by Assistant Olympic Course Designer, Manuel Esparza of Mexico City, Mexico. Andy Kocher of Ocala, Florida and Eagle Valley Partners’ Ciana, winners in Friday’s $10,000 Horseflight Open Welcome, returned to the winner’s circle today in the $35,000 Apollo Jets Grand Prix. Kocher also received a $5,000 gift card toward future Apollo Jets Charter Jet Travel, compliments of Brian Hillen, the Official Jet Charter Consultant for the Gulf Coast and Classic Companies. The first round time allowed was set at 86 seconds which saw ten horse and rider teams advance to the jump off round. “I loved Manuel’s course,” commented Kocher. “I thought it was going to be a course where a lot were going to be clear, but I think that was the goal. He wanted nine or ten. It was a beautiful day and a great crowd,” he continued. “It really turned out perfectly,” Kocher added. “The most challenging part of the first round was the Horseflight jump to the Sidelines jump. Those two were toward the end of the course, the horses were getting a little tired, and going away from the gate you really needed to put your leg on. Then, they would be too strong for the Sidelines jump,” commented Kocher. Kocher was the first to go in the jump off round in the irons of Postage Stamp Farm, LLC’s Prof De La Roque. Although their time of 45.725 seconds beat the time allowed of 62 seconds, they pulled a rail giving them four jump faults. “I was trying to be careful and not go with a lot of speed,” he said. Amanda Comley of Waller, Texas in the irons of Joshua Tabor’s Cancum 2 followed Kocher in the jump off round. A rail at the second fence in a time allowed of 49.926 seconds would see them finish in tenth place overall. Holly Shepherd of Grand Bay, Alabama was next to go in the irons of Loretta Patterson’s Silverstone. They posted a clear round in a time of 49.996 and moved to second position behind Kocher. Fleur de Lis Farms’ Ziezo, ridden by Scott Lenkart of Bartonville, Texas, followed up with a four fault jump off round in a time of 45.900 seconds which would put them in eighth place overall. Kocher returned, this time in the irons of Ciana. “Since I was too careful the first time, I came at it with more speed this time,” commented Kocher. “There was this little girl, maybe 3 or 4 years old, at the end of the arena with her grandparents,” said Kocher. “I walked by before I started my jump off round and she was saying ‘1 2 3 takeoff! 1 2 3 takeoff!’ Her grandparents tried to hush her and I looked at her and said, ‘Okay, 1 2 3 takeoff!’ and I just went,” he said. Take off they did as they turned in the fastest, fault free jump off round in a time of 44.991 seconds. “After I was awarded my blue ribbon, I rode over and gave it to her,” he said. “She looked really happy,” he added. Nicki Wilcox of Parker, Colorado, in the irons of her own J.E.S. Quito, followed Kocher and Ciana. Although the pair went clear, their time of 51.671 seconds would have them finish in fifth place overall. 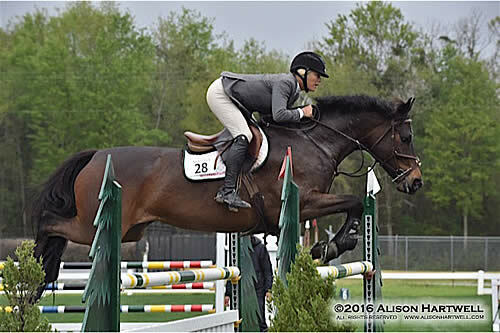 Honorway Farm’s Leander, ridden by Leann Kelly of Valatie, New York, turned in the next clear jump off round in a time of 45.956 seconds which moved them up to a third place finish. Crowd favorite Lochinvar, owned and ridden by Matt Cyphert of Northlake, Texas, also turned in a clear round in a time of 45.725 seconds. Not quite fast enough to beat Kocher and Ciana, their time would find them finishing in second place overall. Shepherd returned to the jump off round, this time in the irons of Patterson’s Triompf. A heartbreak rail at the final fence earned them four faults in a time of 43.688 seconds and a sixth place ribbon overall. DS Holdings, LLC’s Capricello 2 and Frank Owens of Windcrest, Texas were last to go and also suffered a rail at the final fence in a time of 47.742 seconds which would see them finish in ninth place overall. “Ciana is a great horse,” said Kocher. “She won the second week in Pensacola and the Welcome this week. She just did her first FEI class and did some of the ranking classes in the Nations Cup,” he added. “This course looked really nice to her,” he said. “Ciana is nine years old and belongs to Karen Cobb. She owns most of the horses I have ridden over the past year and a half,” Kocher said. “I have about eight showing here right now and some down the road at friend’s farm. We just got four more in and we’ll have more next week,” he added. “I sold a boat load of horses here last year,” said Kocher. “I actually sold more than half a million in horses here last year and no doubt, we will be selling a more for the rest of the circuit,” he added. “I am very pleased with how the Apollo Jets Grand Prix went today,” commented Brian Hillen of Apollo Jets. “The crowd was amazing, the riders and horses were extremely talented and the grand prix field was beautiful,” he said. “I think Bob and Janet did a super job ordering up the beautiful weather we had and I am extremely thankful for the opportunity to sponsor this world class event,” Hillen added.